I grew up in a small town in Massachusetts called Groton. Not Groton, Connecticut, mind you: that johnny-come-lately town was named after my town, and is famous only for the submarine base. Groton is an old town as New England towns go, founded in 1655, displacing Native Americans who would return to burn it down in 1676. It was rebuilt, but every so often yet another fire takes out a piece of the town’s history. Back in the day when railroads were the lifeblood of communities, there was a line that ran through the town, carrying passengers and freight. As a kid, I used to hear the freight trains blow their whistles every day. And along with some friends, I’d try the daring experiment of laying a penny on the rails where the tracks crossed Common Street, to see how the train would flatten the penny when it rolled through. But the railroad through Groton was never a major line. Passenger service had ceased and the town’s train station burnt down before I was born, and freights stopped running while I still lived in town. The right of way could have been abandoned, but the local authorities took it over and remade it into a paved bike trail, running from Ayer, Massachusetts, where the commuter rail still runs from Boston, to Nashua, New Hampshire. I took a ride on the bike trail earlier this month for the first time. It was nearing peak foliage season, and I wanted to do some leaf peeping. And while I was passing through Groton, I took a few detours to see some of the local history there. 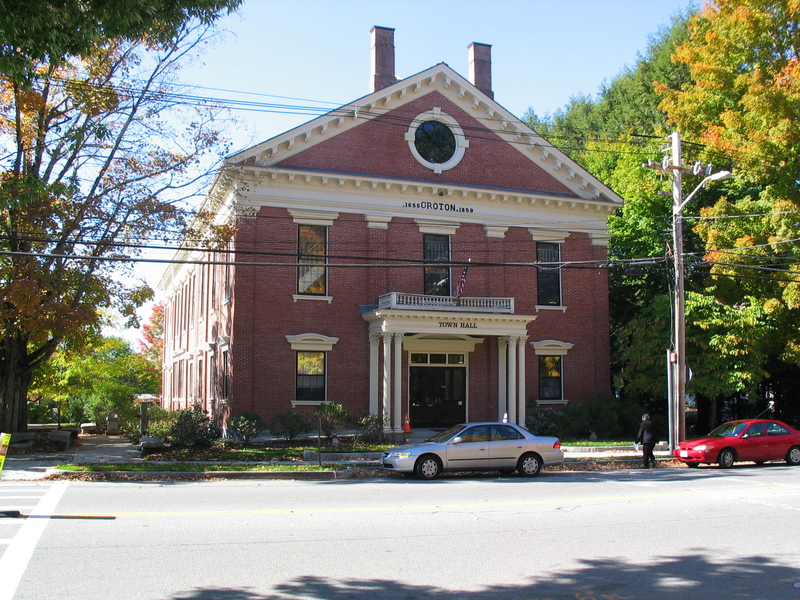 If there is anything Groton is nationally famous for, it is the Groton School, a “prep” school founded in 1884. Franklin Delano Roosevelt went there before going off to Harvard. There’s a nice view from the Circle at the center of the campus, currently marred by the reconstruction of the Schoolhouse. 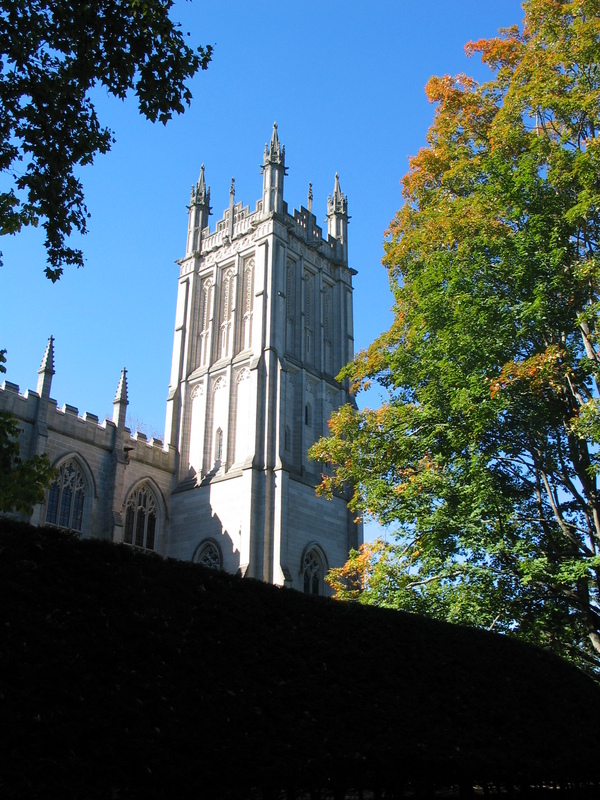 The most striking building on the Circle is the chapel, a stone Gothic structure that stands in sharp contrast to the brick buildings around it. The bike path has easy access to downtown Groton because the old railroad station was at the end of a short side street off the main road. George Boutwell, who served as the state’s governor in 1851-52, built his house on the main road facing the station. For much of his life working as a lawyer, he’d walk from his front door down the side street to the station to take the train in to his office in Boston every day. It was said he was so regular you could set your watch by him. Boutwell didn’t start as a lawyer. Before that, he’d been a teacher. And when he first came to Groton, he worked as a clerk in a store. The building still stands. 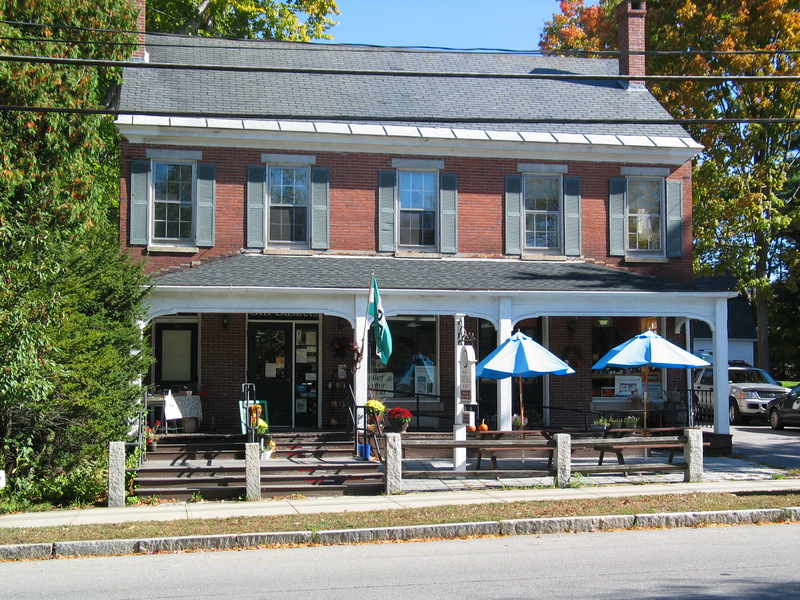 After years of being the town’s post office, it is once again a store. 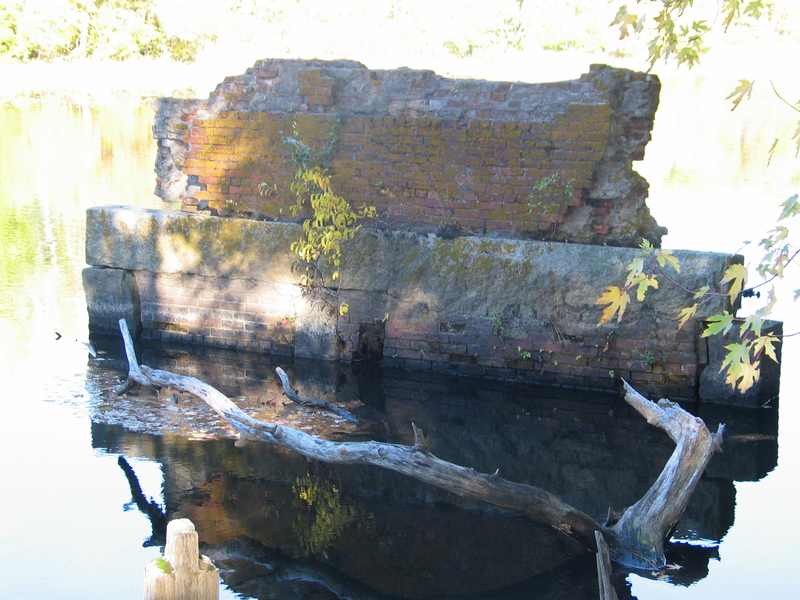 Further up the river is evidence of Groton’s industrial past. 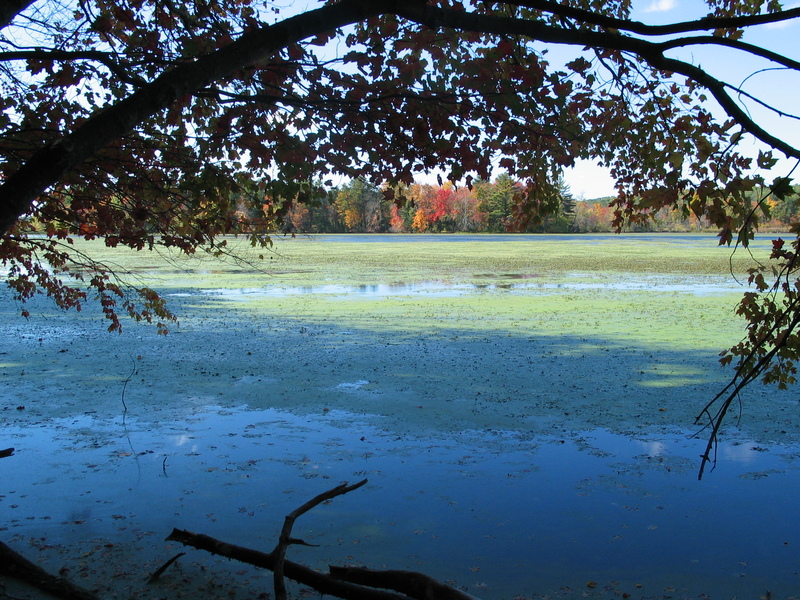 The Nashua River and its tributaries were a source of water power for many mills, which provided much of the freight traffic for the railroad. But cheaper labor in the South doomed the New England mills. This one here burned down before I was born and was not rebuilt. I remember when this brick wall used to stand three stories tall, but the elements have caused it to crumble. There are still mills and dams on the river. The one in East Pepperell, Massachusetts makes the river slow and sluggish in the interval between that community and the burnt mill. Yet a half a century of work have made the river look clean and lovely, quite a wonder for those of us who remember it changing its dismal polluted colors by the season! And that was my bike ride, from Ayer through Groton to East Pepperell. It was a good ride, both for foliage and for history. 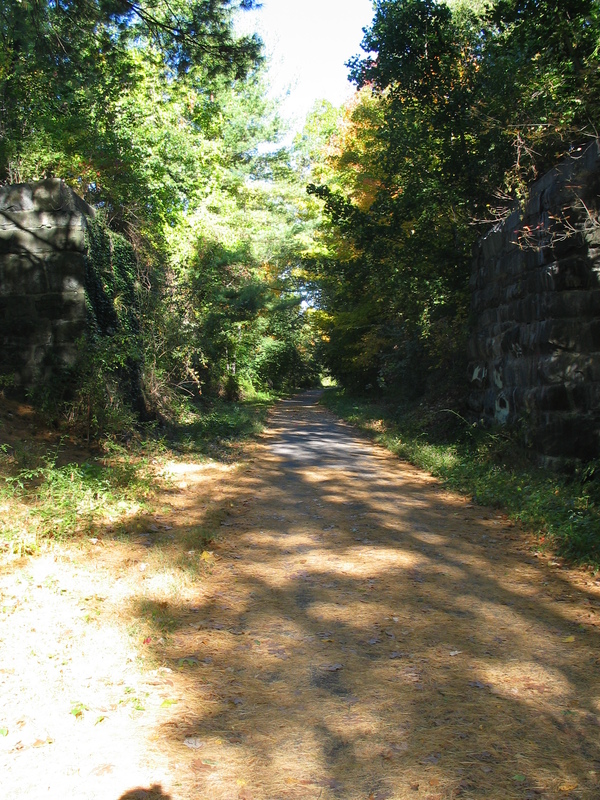 This entry was posted in Local history and tagged Boutwell, George Boutwell, Groton, Groton School, Nashua River, old mill, rail trail, railroad on October 21, 2014 by Brian Bixby.